It hits nearly everyone at some time in their life. Horse fever. That undeniable urge to go riding on a sunny spring day, and to feel the wind in your hair as you gallop on the sandy beach. Horses have long been objects of great love and passion. However, in our more modern world, many horse lovers no longer have the time or space to keep the object of their desire. So what is the next best thing to a real live horse? Why, collecting Breyer Model horses, of course! The Breyer Molding Company began making model horses in 1950, at the request of the Mastercrafter Clock Company. They had a mold for a standing horse in western gear that they wanted produced for their clocks. Since Mastercrafter was unable to cover the molding expenses, Breyer kept the mold as payment. They began making the Western Horse individually for Western Stores and the C. W. Woolworth Co. The models sold well, and Breyer Animal Creations was born. Reeves International of New Jersey bought Breyer Animal Creations in 1984, and continues to produce them today. Creating a model is very labor intensive. Initially, artists sculpt a clay model, which is then used to produce steel molds. The steel molds are expensive to produce, and are very fragile. Cellulose acetate pellets are melted, and then injected into the molds under high pressure. Models are then cooled before they are assembled and finished. Each model is painted with airbrushes, with final touches being done by hand. There are four sizes of Models; Traditional, at a scale of approximately 1:8, Classics at about 1:12, Little Bits at 1:20 and Stablemates at 1:32. Not only does Breyer produce many different molds, they also make many painting variations as well. Generally, collectors refer to the mold as the body shape of a particular animal. The model is the color of the particular mold. For example, the Traditional Black Stallion mold was originally painted black to look like Walter Farley’s famous horse character. Later models used his body, with differing paint schemes to produce an appaloosa, a dapple gray, a bay, and others. There can also be variations in the actual paint job on any particular piece. These interesting differences make collecting fun, as no two pieces are ever identical! 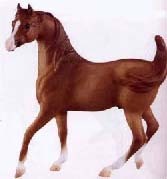 Usually Breyer models can be identified by the raised Breyer copyright mark on the inside flank of a back leg. Most marks include the country of manufacture (usually USA, but sometimes China or Mexico), a year, and a C for copyright. It will also generally contain BMC, B, Breyer, Breyer Molding Co., Reeves, or some combination of the company identification. These molded marks were introduced in 1960. Prior to that models were marked with stickers or hang tags, which were most often removed. Black, Bay, Chestnut and GOLD? Most of the models produced come in realistic horse hair colors. However, there are several “Decorator” colors that are highly collectible, and totally NON-realistic. Gold Charm is a solid metallic gold color, with white face, mane, tail and feet. Florentine is a dappled version of the Gold Charm. Wedgewood is a beautiful light blue with white points that resembles Wedgwood china. Copenhagen is the dappled version. Silver Filigree and Ageless Bronze are two new decorator colors introduced recently, and so far each has been used on only a couple of models. 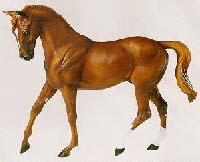 Breyer also produced models to look as if they were carved from wood. These can appear very realistic, and are brown, with light and dark streaks to mimic wood grain. Many of the molds and models are created to represent real horses, or famous horses from literature. Misty of Chincoteague is one of the most beloved horses of all time, and has her place as a Breyer model, along with many others made famous by author Marguerite Henry, like Stormy, Brighty, Sham, and San Domingo. Pilgrim, Black Beauty, and Smoky the Cow Horse are a few horses from other authors. Phar Lap, Man O’War, and Secretariat are some of the well known race horses, and jumpers Big Ben, Touch of Class and Gem Twist are also represented. Well known horses from within the different breeds are also featured. Many people like that there are real horses portrayed, and will collect famous horses or a specific color. The variety and limited editions also make Breyers collectible. Breyer produces special runs at the request of companies, and for special events. Special model colors have been produced for the catalog divisions of JC Penney, Sears, Spiegel, and Montgomery Ward. They have also introduced special model colors for QVC, Toys ‘R’ Us, and PETsMART. 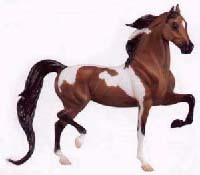 Once or twice a year, Breyer produces a model for “Just About Horses” subscribers and for those attending “Breyerfest”, a yearly festival usually held at Kentucky Horse Park. Like everything else, Breyer models have gone up in price, but many are still reasonable. Foals and smaller horses can often be found for under $15. The larger traditional models generally run from $20 to $50. Special runs and limited editions vary considerably in price, depending on the scarcity of the piece. Unusual colors or hard-to-find models can add to the price. Models in the decorator colors can run close to $1000. The condition of a model can also affect the value. Like most collectibles, those in mint condition bring a higher price than the pieces that have been handled excessively and show wear. Wood grain foal photo by UrbanKaos. Other photos courtesy of Brenda Lawrence, Falling Brook Enterprises.